The Division for Social Policy and Development commissioned a study on family indicators to guide policy makers in their development of effective family policies. The study provides a critical look at current practice regarding indicators, as well as the basic conditions necessary for the establishment of a comprehensive array of family indicators. In such a conceptual approach, a definition of the term “indicator” is central to the analysis, followed by a brief examination of the concept of the family. Finding a single definition is hindered by the diversity of families in both developed and developing regions. The study shows that the real meaningful unit for the creation of family indicators is the household, while the family remains a fluctuating concept, its form and content reflect social and political choices. 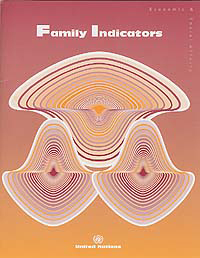 Family Indicators is a United Nations publication, Sales No. E.03.IV.4, ISBN 92-1-130225-0.